YouTube is the #1 place to share video content, hands down. 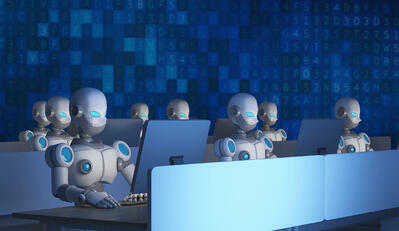 It’s the second-biggest search engine after Google, boasting an incredible 1.9 billion monthly users. Now more than ever, using video in your social media marketing strategy is becoming the norm. From big tech companies to small businesses, marketing teams are incorporating video content regularly into their tweets, stories, and posts. TrueView Ads: The standard ad format on YouTube. Pre-roll Ads: Can be non-skippable and can be placed before, during, or after the video. Bumpers: Shortest ad format on YouTube, lasting only six seconds. If you’re not using video to market and advertise your brand online, you’re missing out on a huge opportunity to reach a lot of people. Almost 5 million videos are viewed on YouTube daily. Yes, daily. With an average of 300 hours of video being uploaded every minute, integrating YouTube ads into your marketing repertoire is a no-brainer. With so much competition online, it’s important to put time and effort into your brand’s video production. Running ads on YouTube is a great way to reach more of your target audience, so let’s start at the beginning and talk about the ad formats YouTube offers. YouTube is the hub of all things video, so it’s clear that producing video ads on the site is the most efficient way to advertise to your potential audience and build your presence. Let's talk about the three video ad formats. Trueview ads are the most common ad format on YouTube. 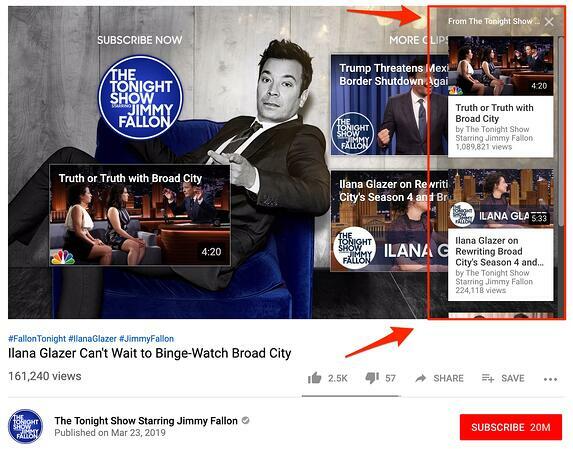 These ads can be skippable or non-skippable and are customized to promote different content based on the viewer. 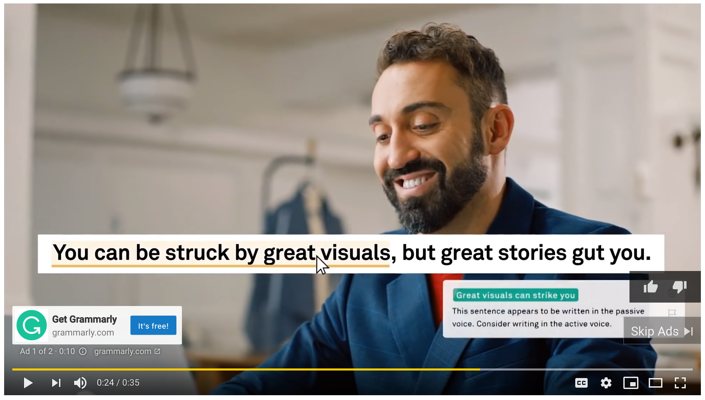 The great thing about Trueview ads is that the advertiser will only pay for them when people watch at least 30 seconds of the ad or if they interact with it (by clicking the CTA on the screen). However, YouTube has a few restrictions on Trueview ads. 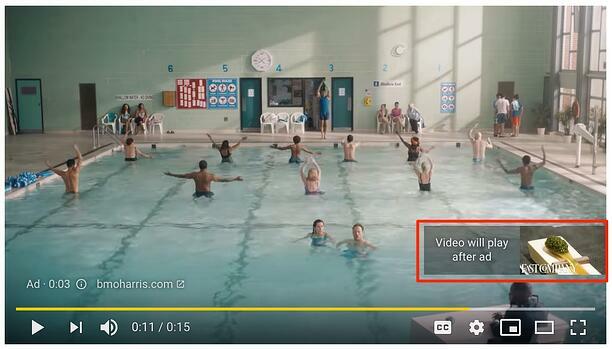 The skippable ads must last between 12 seconds and 6 minutes, while the non-skippable ads must be 15-20 seconds. There are two types of Trueview ads: Video discovery ads and display ads. 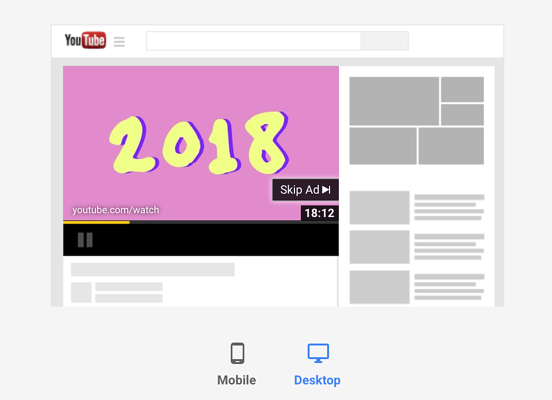 Formerly known as in-display ads, video discovery ads appear on the homepage of YouTube, on the sidebar as related videos, and on search result pages. Because they’re “discovery” ads, there is no limit to their length since people can click on them willingly. The ad displayed may not always correlate with what the viewer is searching for, but most of the time, it will. 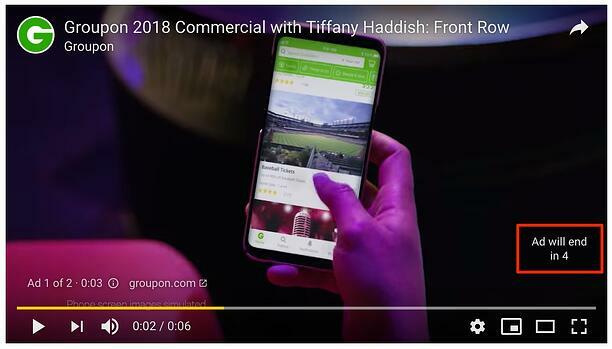 Video discovery ads will appear after you perform a YouTube search. 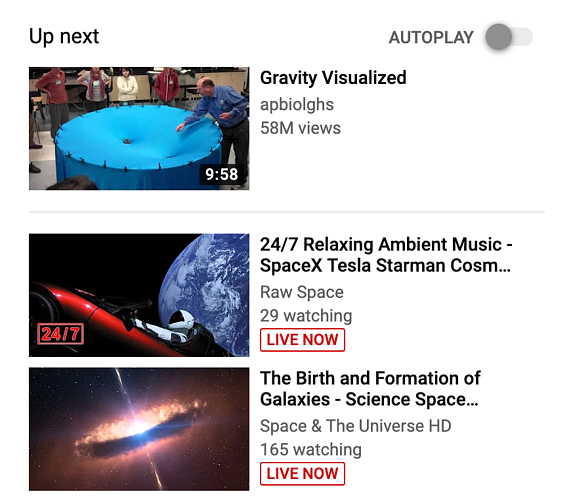 These ads can also appear as a suggestion within related videos on the sidebar. In-stream ads, are the second type of Trueview ads and are placed before the video. If the video is longer than 20 seconds, the viewer has the option to skip it. In-stream ads are a great motivator for advertisers. A good goal is to strive to create an ad that viewers won’t skip. If you can capture the audience, you’ve won half the battle. Advertising with Trueview ads is a good option for a few reasons. They’re cost-effective:If you’re trying to reach a wider audience without breaking the bank, using Trueview ads is one of the best options. You’ll only pay for the ad when it’s been played for longer than 30 seconds (or entirely), or when the viewer takes action and clicks on it. Plus, since people can skip your ads after five seconds, you’ll rarely be spending money on audiences that have no interest in your brand. Win win win. As mentioned before, YouTube has a huge amount of daily users. When placing ads, YouTube will do it’s best to serve your ad to an audience that may be interested. They can target people like this because they analyze users’ Google search history and place ads where they’ll have the best chance of getting engagement. Using Trueview ads gives advertisers the opportunity to connect with the audience. Great story-telling will capture attention much faster than seeing the same commercial over and over again. If you’re creating an ad campaign, think about the type of ad you wouldn’t skip and try to take inspiration from it. When brands release an ad that inspires people, it’s often met with increased ROI and sales. Pre-roll ads can be placed before, during, or after the video and are non-skippable. These ads are short and sweet, restricted to 15-20 seconds in length. Pre-roll ads can also appear as mid-roll ads which are placed in the middle (shocker) of videos that exceed 10 minutes in length. I get it, non-skippable ads can be annoying to viewers, but if you have a marketer’s brain, you will see the value in pre-roll ads. Because people cannot automatically skip your ad, you’re guaranteed that they’ll at least hear it while they wait those 20 seconds before the video they actually clicked on. Make that audio memorable. Utilizing these 15-20 seconds can be incredibly beneficial. 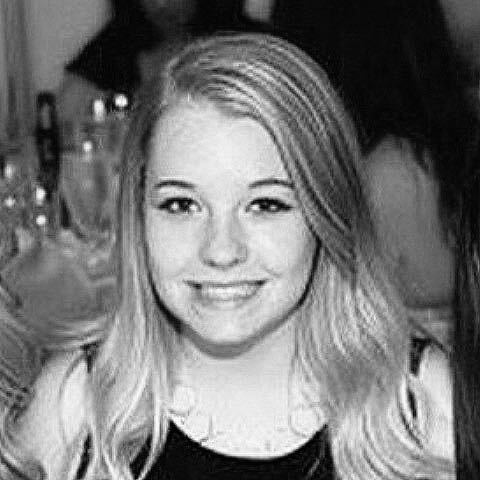 Tell a short informational anecdote, a funny story, or just be totally blunt with the viewer. Just make sure to have a concise idea that conveys your message clearly. Bumper ads are the shortest ad format YouTube offers, only lasting 6 seconds in length. These ads play before videos and are non-skippable. 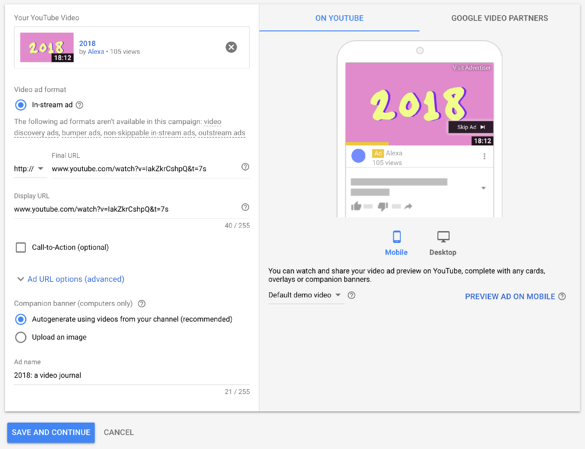 Although they’re short, bumper ads are handy if you’re recycling video content and want to spread your campaign across YouTube. Bumper ads are great because you cut down on that annoying non-skippable ad time while still advertising your brand. So you already have a YouTube channel and you’ve created a marketing campaign video that you want to advertise. Now, it’s time to create your video ad campaign. You’ll first need to set up a Google Adwords account. Once signed in, you’ll want to link your YouTube account. Click Tools in the top navigation bar. A drop-down menu will appear. Click Linked accounts. By clicking through, you’ll land on a page with a variety of options. To link a YouTube account, click Details under the YouTube box. 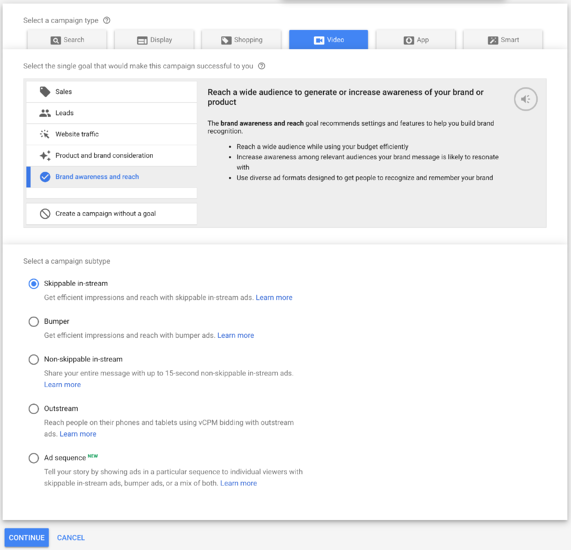 Enter your channel URL to link it with Google Adwords. Once linked, it should clarify that it’s linked and look something like this. Now that you’re good to go, let’s create your campaign and advertise your content. On the Google Ads homepage, click Campaigns on the side toolbar, +Campaign, then New campaign. Choose Video. Select your campaign goal and subtype. 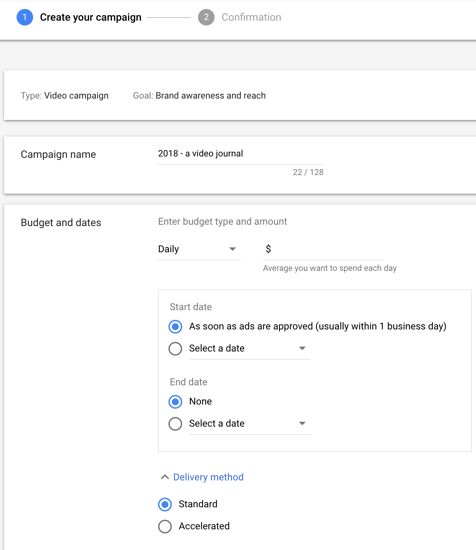 YouTube provides a variety of campaign goals such as Sales, Leads, Website traffic, Product and brand consideration, and Brand awareness and reach. 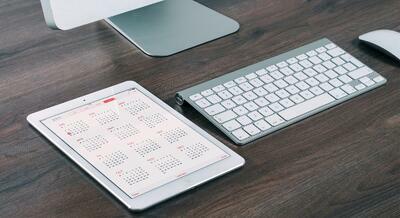 You can always create multiple campaigns and try out a couple of different goals. For this example, we’ll choose Brand awareness and reach and skippable in-stream ad. 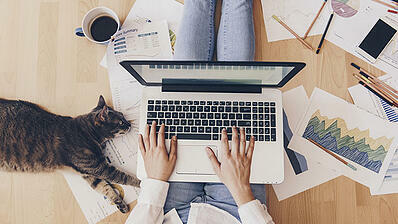 After selecting an ad format, give your campaign a name, set your budget, and choose start and end dates. You’re also given the option to start advertising as soon as your ad is approved. Next, you’ll need to set up Bidding. This is a crucial step in the process because getting it right will directly impact how successful your ad campaign is. There are many options when it comes to selecting a bid type, but the type you will be able to use depends on the campaign objective you selected earlier. Because we chose brand awareness and reach for this example, we only have the choice to select Target CPM. With Target CPM (cost-per-thousand impressions), you get to set an average amount you’re willing to pay for every thousand times your ad is shown. When you set your bid amount, Youtube will optimize bids to assist you in getting as many impressions as possible. 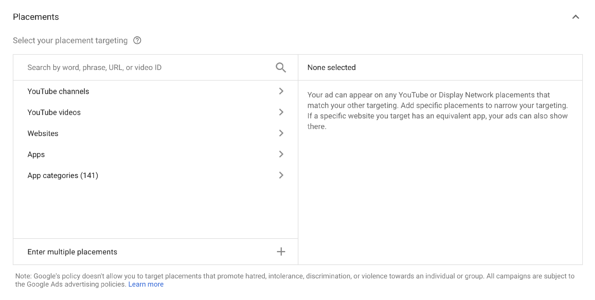 YouTube Search Results: This option will be available if you are running discovery ads. 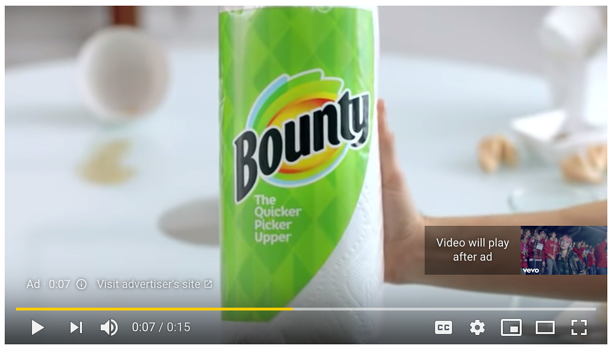 YouTube Videos: This is the usually the favorite option of advertisers. You get the best deal on quality and price. Video Partners on the Display Network: Choose this option if you want to run ads on partner sites. Below Networks, you can choose the languages your audience are likely to speak and the locations they’re likely to live in. While you may not know every location your audience resides in, you can reference demographic data from Facebook Audience Insights or Instagram Insights (assuming you have business accounts set up on both platforms). If you have a general idea of where your audience lives, you can enter those locations into the Target locations box. If your brand does a lot of business online, you might choose a couple of locations you think may capture most of your audience and go back later to fine-tune your targeting. Inventory type controls what kind of videos your ad will appear on. 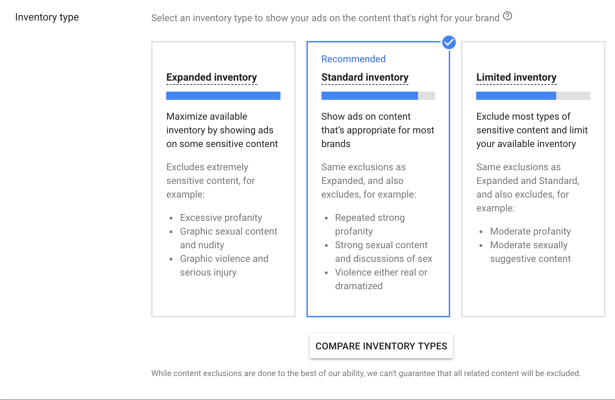 If you’re running ads for a family-friendly brand, choosing Limited inventory will let YouTube know that you only want to advertise on videos with moderate profanity and sexually suggestive content. 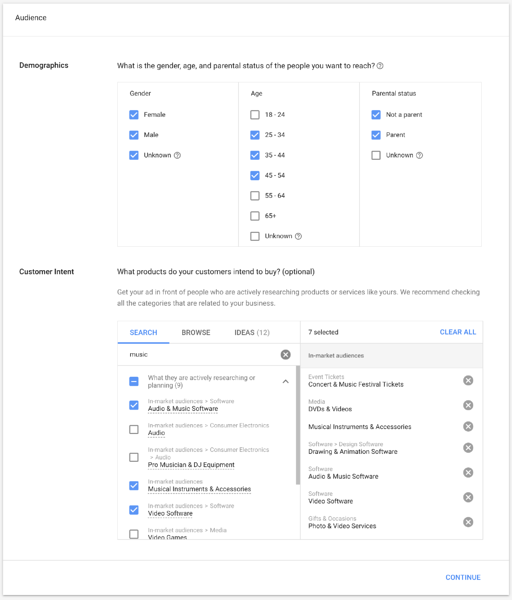 Choosing the correct inventory type is just another way to control who views your ads. Excluded Content lets you have an even more controlled say on where your ads appear. You can choose to exclude certain types of content such as Sensitive social issues, Profanity & rough language, and Tragedy and conflict. YouTube also allows you to exclude types and labels. For example, if you’re erring on the side of family-friendly, selecting DL-MA: Mature audiences will exclude your ad from all videos with that label. Next up is Device, Frequency capping, and Ad schedule. You get to choose which devices your ad appears on (we suggest all) and when your ads run. If you choose to set a frequency cap, you can limit how many times your ad can be served to the same viewer. Choosing this can help you assure you’re not over-exposing your brand to the same audience. Next, you’ll be asked to narrow down your audience by gender, age, parental status, and similar audience interests. This is where you can really hone in on the audience you want to reach. If this is your first time setting up a YouTube ads campaign, selecting a wider audience range at first will help you determine your audience in the long-run. You can always revisit the campaign, see what’s working, and adjust your selections later on. Selecting topics that are similar to your brand can help you expand your reach. Let’s say you’re advertising a new video editing software. Adding Video Software or Photo & Video Services will run your ads on content that touches on those topics. YouTube let’s you choose where you want to advertise. Under Placements, you can add specific places to narrow down your targeting. It’s finally time to create your ad. Under Create your video ad, choose the video you want to use in your YouTube ad campaign. You can customize how your ad looks here. Because we chose to advertise using in-stream ads earlier, other ad formats will not be available. 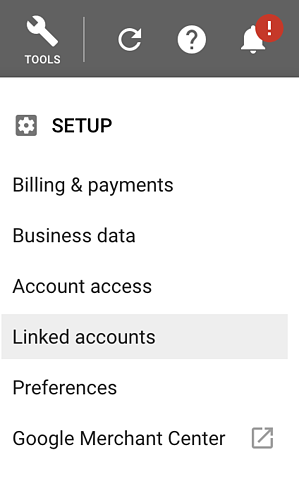 You have the option to add a CTA if your campaign calls for it as well as uploading a companion banner (although it’s recommended to use the autogenerate using videos from your channel option). You can also toggle between Mobile and Desktop to see how your ad looks on both formats. Once you’re happy with the information you’ve entered, click Save and continue. Congrats, you’ve successfully set up your Trueview in-stream ad campaign and have started your journey of advertising on YouTube! Don’t worry, setting up a bumper or pre-roll ad campaign follows a very similar set of steps. Just select those options when prompted. 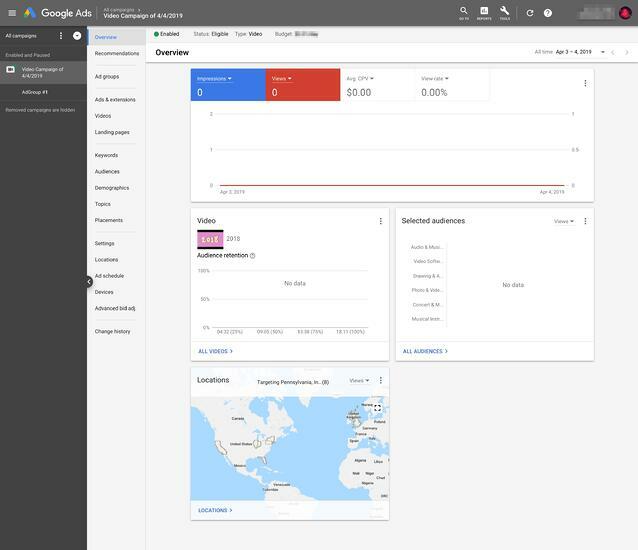 Now, before you explore your campaign, wait at least a week to view your impressions and views (you’ll actually have data displayed, unlike our example). But to give you a look at what data points you can track, we’ll show you our barren results anyway. This is what your campaign page will look like. 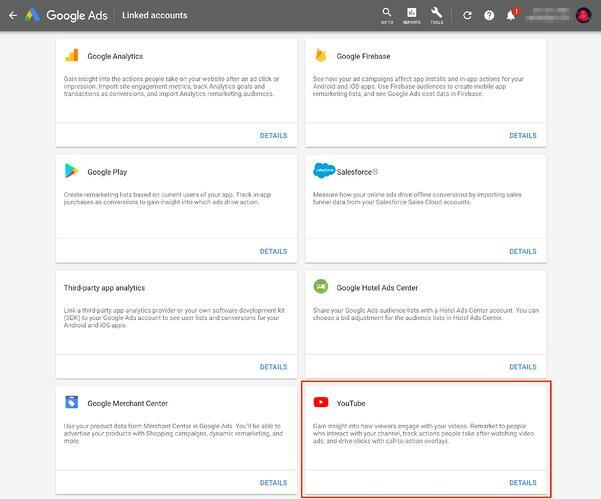 Although there’s no data to show, you get a sense of what YouTube and Google Ads will be tracking throughout your campaign. If you don’t want to go all in right away and start advertising with in-stream, pre-roll, or bumper ads, you can always advertise with Display ads, Overlay ads, and Cards. Display ads will appear as a large advertisement above the video suggestions list. You’re probably most familiar with overlay ads. They appear as a banner that lines the bottom of a YouTube video and can be clicked out of. If you’re looking to get exposure without having to produce a full-fledged advertisement, this ad type is the perfect solution. To find out how to run overlay ads, Google has you covered. Cards are a non-invasive but effective way to advertise your content on YouTube. You can set them up to appear within your videos to entice viewers to watch more of your content. Go to the Creator Studio on your channel. Click on Video Manager and choose the video you want to appear in the card. Click Edit, Cards, Add Card. Select the type of card you want: either video or playlist to advertise and push the content already on your channel, or Link to direct the viewer to another page. Once created, you can choose where the card appears on the video. There are a ton of ways to promote your brand or business on YouTube, and it doesn’t necessarily have to be through traditional YouTube ads. Make sure the first 3-7 seconds are interesting. The viewer’s attention span will check out as soon as they see an ad, but if there’s a snippet of audio or a frame of video that stands out, the viewer may end up watching your ad. Tell a story. You’re really able to take the viewer on a mini-adventure with advertisements. Whether you’re using a skippable or non-skippable ad, taking advantage of a topical or relevant subject within your ad will increase your chances of capturing the viewer’s interest. Focus on one thing. Believe it or not, packing too much content into one ad is a mistake. Keep it simple. Think about the industry you’re in and how brands similar to yours are advertising. You can run one of two ways with your ad campaign. Replicate that same feeling, or do something completely out of left field. The choice is yours. YouTube Live can be a great tool in promoting your brand. Viewers are invited to watch a livestream with hundreds or even thousands of other viewers. There’s a chat box as well, so people can directly interact with you or each other! Let your audience know you’re going LIVE ahead of time so they can make the stream. In the age of now now now, going LIVE is a good way to give your audience a deeper look into your brand. Make sure to amply prepare so you can give your viewers an enjoyable experience. In August of 2018, YouTube rolled out the Join feature. It gives viewers the option to access special perks for a set monthly fee of $4.99. 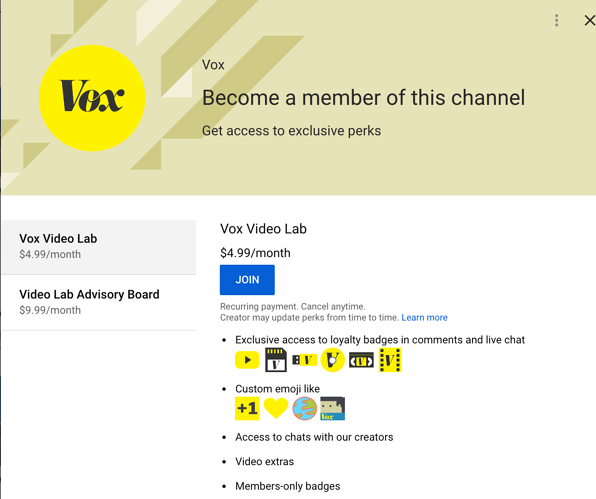 Not all brands may think using this feature will benefit them, but by adding it to your channel, you automatically add an “exclusivity” factor to your content. They’re essentially joining a secret club. If people care about your brand, they’ll want to see the extra content you’re offering. YouTube creators and influencers see the best results by adding a Join button. When you set up a membership wall, you create an extra stream of revenue. Adding this feature is especially lucrative if your brand creates a lot of media content. Viewers who are devout followers of your brand or channel receive special badges that are displayed next to their name when they comment on videos. Think about how that’ll look on competitors pages! You’ll need a minimum of 30,000 followers to add the Join button to your channel. You’ll receive 70% of the profits made by the Join button. Video content has become a huge part of online advertising. It’s one of the quickest and most interesting ways to promote your brand. Because YouTube and Google have teamed up on their advertising efforts, it’s even easier to target your audience. They dig through the data and search histories for you, reporting back the data they think you can utilize to better target. YouTube has become a prime place on the internet to advertise, but competition is fierce. If you continue to focus on your audience, create great content, and optimize your ads, you’ll grow your brand far into the future. For a closer look at growing your brand on YouTube, discover the perfect YouTube banner size and how to get more views on YouTube.